Last week, a video of Rodney Kim Jr. being kicked, beaten, and jumped on in his high school football team’s locker room went viral. The beatdown was recorded at Davidson High School on April 27 following a spring practice session. The attack resulted in a broken arm for Kim Jr., who is 14 years old. According to Al.com, Kim underwent surgery to repair the broken arm; he won’t return to Davidson, as his parents plan on having him move high schools. 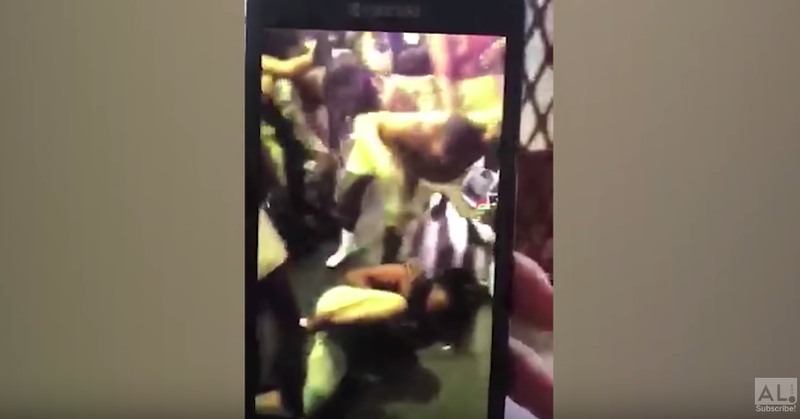 In the wake of the video blowing up, Mobile County District Attorney Ashley Rich reacted by stating that she intends to bring charges against the fellow high schoolers involved. Fox10 reports that three of the four suspended students are already in custody. Davidson High suspended four students but maintained that the coaches intervened and broke up the beating once they heard the wails from the locker room. Kim Jr., however, told his parents that the same kind of hazing scenario took place with a freshman on the team just the week before. Fox10 reports that since the video’s release, six Davidson High employees and 10 parents have approached the Kim Jr. family to speak about separate instances of hazing. “My son did not deserve this. And everyone is dragging their feet, it’s going to long so that’s why we’re doing what I think is best for my family, and that’s why we’re moving forward with the lawsuit,” said Rodney Kim Sr. at the news conference. 1.) For Davidson to forfeit all football games in the 2018 season. 2.) For each of the school’s football coaches to be fired. 3.) For all 20 football players involved in the beating to be charged. 4.) For hazing to be banned in all high schools across the nation. Neither Fred Riley, Davidson’s head football coach, or Martha Peek, Mobile County’s superintendent have been made available to comment since the release of the video.